Since 1992, United Storage in Lansing, NY has provided convenient, affordable and secure self-storage options and commercial space for lease. Customers and businesses throughout Auburn, Ithaca, Syracuse and the surrounding area count on us because we treat each and every customer like family with friendly and accommodating customer service. 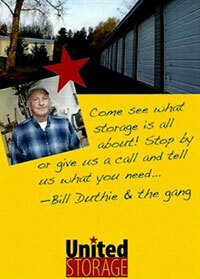 Need a rate on storage space? Call us at 607-533-4300 or fill out the form below.